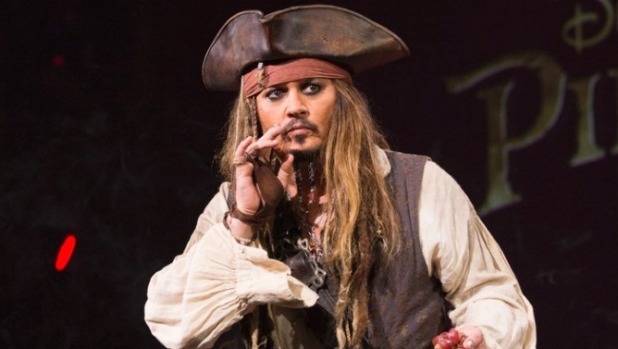 Johnny Depp shocked visitors at Disneyland in California by appearing as Captain Jack Sparrow in the Pirates of the Caribbean ride on Wednesday. The 53-year-old actor, who will return to cinemas as the dishevelled pirate in May, gave theme park visitors in Anaheim a chance see his famous character in the flesh on the indoor boat ride, which inspired his swashbuckling movie franchise. Johnny’s surprise appearance delighted fans, who then posted videos on social media of him interacting with riders as Captain Jack as they passed him by on the boats. In the videos, Johnny joked that he wanted to “commandeer” their ships, a line from the first movie, and greeted fans outside the front of the ride while leaning over the edge of a balcony. The four previous Pirates of the Caribbean films combined have taken more than US$3.7 billion (NZ$4.5b) in cinemas around the world. The fifth instalment, Pirates of the Caribbean: Dead Men Tell No Tales, will feature Captain Jack taking on his old nemesis, the ghost pirate Captain Salazar, played Javier Bardem. Johnny’s Disneyland visit is not the first time the actor has appeared in public as the iconic character as he has often dressed up as Jack to visit sick children at London’s Great Ormond Street hospital. The actor has a personal connection with the hospital as his daughter Lily-Rose, 17, was treated there for renal failure in 2007.